Lorna the Jungle Queen, number 4 from 1953. Good old comic in pretty rough shape. No reserve. Grade is CBCS 9.2 ( near mint minus ). Cover married. The pages are off-white to white. what about foreign countries?. The comic is in very good , creased, off-white pages. 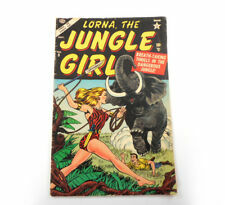 Cover features Lorna the Jungle Girl saving a man from a stampeding elephant. Atlas publication. Sept 1954 No 9. This is normal in our experience. The price may vary based on size, weight, and location. Is the item pictured the exact one for sale?. Multiple art pages can easily be combined because they are light and thin. Jungle Queen. ~ Atlas / Marvel - #2 - 1953 ~. Gold / Silver Age Comics. The book is complete & flat with no spine roll. There are defects as expected in this grade including a 3” split at the foot of the spine. THE ITEM: "GOOD" condition. Lower grade. Spine weear, splitting in places, but not one general area, so still holding overall. "Jungle Outlaw!". "Pool of Doom!". "Leopard Lure" text story. "The Hunter and the Hunted! "., script by Don Rico, art by Syd Shores; A lion pursues an otter. 36 pgs., full color. Published 1955 by Atlas. This is normal in our experience. The price may vary based on size, weight, and location. Is the item pictured the exact one for sale?. Size: 7" x 10". Multiple art pages can easily be combined because they are light and thin. Atlas Comics, 1955. JUNGLE ACTION #4. Sorry, USA only, no exceptions. We have been serving collectors since 1982. We have a spotless record for integrity and service. We are always interested in buying quality collections. Grade: VG. Lorna The Jungle Girl #12. 1955 Marvel/Atlas Comics. Grade: G/VG to VG-. Lorna The Jungle Girl #13. Lorna The Jungle Girl #17. 1956 Marvel/Atlas Comics. Grade: GD 2.5. Published 1954 by Atlas. This is a low grade item. It will be complete and readable, but will show significant wear. Comic Book Grading Scale. Cover art by Carl Burgos. "Rampage," script by Don Rico, art by Werner Roth; Boggs and Quinn capture animals and starve them; They want to capture Agu and trick Greg Knight in helping them. "The Man on the Tiger" text story. Jungle Girl. ~ Atlas / Marvel - #9 - 1954 ~. Gold / Silver Age Comics. The cover and centerfold are attached. Paper quality is off-white. The book is complete & flat with no spine roll. There are minor defects as expected in this grade. Cover art by Carl Burgos. "Magic Music" text story. "The Black Swamp! "., script by Don Rico, art by Werner Roth; Greg escorts a botanist into the Black Swamp where they are attacked by crocodiles and rescued by Lorna. Two very nice Jungle Action comics. First story reprinted in Astonishing Tales # 9 (December 1971). Back-up Greg Knight story, "Safari to Doom" (art by Syd Shores). Two-page text story, "Maya Mystery.". Vince Colletta cover (with Al Williamson inks?). Gary Dolgoff Comics. Other than large piece out from bottom of cover, comic is in ok shape. Be sure to add "gdcomics" to yourfavorites list! Easthampton, MA 01027. Is now automatically calculated based on your location. Cover art by Carl Burgos. "The Lost City! "., script by Don Rico, art by Werner Roth; Lorna looks for the Lost City; She is captured. "Island Taboo" text story. "The Treasure of Wajiji! "., script by Don Rico, art by Jim Mooney; Jeremiah found the treasure of Wajiji. Published 1955 by Atlas. Grade: GD 2.0. Cover pencils by Syd Shores. "The White Peril!". "The Test of the Thousand Perils!". "Jungle Stampede" text story. "Bull Elephant!". 36 pgs., full color. First edition ever of Jungle Action! All pages and front and back cover are attached. Will be shipped bagged and boarded. Hi There, Up for sale today I have a Atlas Jungle Action #3 Comic book in Fair condition a small tear to the cover. As always, please feel free to message me with any questions prior to buying and thank you for looking! Also, we do combine shipping, so by all means please feel free to take a look at some of our other items in our store before checking out...we have upwards of 1000 collectibles in our current inventory, so chances are might have something else that you are looking for! Bid/Buy with confidence...I am an experienced seller with A feedback, tons of return customers, professional packing and very quick shipping! Thanks Again! Cover art by Carl Burgos. "Jungle Fever!". "Valley of the Dead!". "The Outcast! "., script by Don Rico, art by George Tuska; A white leopard kitten is abandoned by its mother who fears that the father will reject it; When the white leopard has grown to adulthood, he encounters his family, who accept him. Published 1954 by Atlas. This is a low grade item. It will be complete and readable, but will show significant wear. of comics, generally about 25-40 comics depending on page count. If you are not familiar with comic book grading. Lo-Zar in "The Challenge of the Flaming Spear" (art by Syd Shores), Jungle Boy in "Lost Tribe," Man-oo the Mighty in "Jungle Vengeance" (art by Shores), Leopard Girl in an untitled story (art by Vince Colletta?). Spicy Good Girl art cover by Joe Maneely. Lorna, The Jungle Queen. Publisher: Atlas. This includes CGC, PGX and CBCS graded comic books. No exceptions. Issue: 12 /Year: 1955Condition: VG. JUNGLE TALES 4 VG/4.0. ITEM FOR SALE. 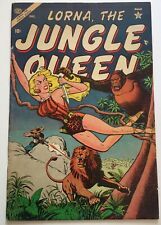 This is a classic, must have, tougher to find issue of JUNGLE TALES from 1955 and ATLAS.great action with JANN OF THE JUNGLE, CLIFF MASON WHITE HUNTER, WAKU PRINCE OF BANTU, THE UKNOWN JUNGLE.nuff said! Published 1955 by Atlas. Cover pencils by Syd Shores. "The White Peril!". "The Test of the Thousand Perils!". "Jungle Stampede" text story. "Bull Elephant!". 36 pgs., full color. This is a low grade item. Gary Dolgoff Comics. Our user ID = gdcomics. Easthampton, MA 01027. JANN OF THE JUNGLE #14 - AND JUNGLE TALES! This is normal in our experience. The price may vary based on size, weight, and location. Is the item pictured the exact one for sale?. Size: 7" x 10". Multiple art pages can easily be combined because they are light and thin. Condition is Poor-Fair but complete. Centerfold attached. Covers detached. See photos. Buy this one for the gorgeous Jay Scott Pike Pre-Code GGA! In 1988, Gelb saw his first work of fiction published, with SPECTERS, a horror novel. Cool cover highlights this classic, must have, tougher to find issue of JUNGLE TALES from 1955 and ATLAS. super mix of JUNGLE THRILLS JANN OF THE JUNGLE, THE UNKNOWN JUNGLE, WAKU PRUCE OF THE BANTU, CLIFF MASON WHITE HUNTER and more.nuff said! Lorna stars in "The Sacrifice," "Death From the Skies," and "Moon Madness!". Greg Knight back-up story, "The Last Victim!". (art by Al Hartley). Two-page text story, "The Maddened Herd.". Syd Shores cover. Atlas Comics, 1955. JUNGLE ACTION #4. We have been serving collectors since 1982. We have a spotless record for integrity and service. We are always interested in buying quality collections. Lee's Comics. Published 1954 by Atlas. Grade: VG- 3.5. This is a low grade item. It will be complete and readable, but will show significant wear. Comic Book Grading Scale. Jungle Action #6 - CGC 8.5 VF+ Atlas 1955 -SCARCE- Single HIGHEST GRADE!!! Jungle Action #6 ATLAS 1955. Scarce - last issue! Single HIGHEST GRADE with only three copies graded in total on The Census! Beautiful CGC 8.5 (VF ) example - White Pages with Excellent Gloss quality ! Grade: GD 2.0. Published 1955 by Atlas. This is a low grade item. The story will be complete and readable, butthe item itself will have major defects. One staple missing. Comic Book Grading Scale. Cover art by Russ Heath. "Jungle Fangs! "., script by Don Rico, art by Jay Scott Pike; The natives are aroused by a Kremlin agent to drive out Pat and Jann. "Blood Brother to the Lions!". "Jungle Diplomats" text story.